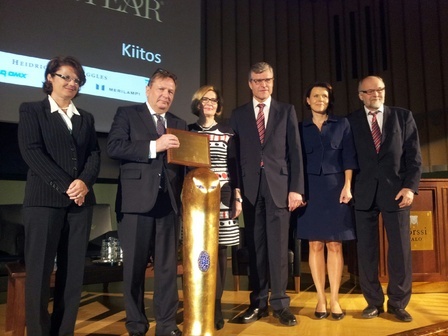 From the left: Chair of jury Marina Vahtola, Chair of the Year 2013 Jari Paasikivi, Minister Paula Risikko, Simo Palokangas, Raija-Leena Hankonen KPMG Partner, Petteri Wallden. the best listed and unlisted company's Chairman of the Board and further selected from among those: Nordic Chair of the Year 2013. The Nordic Prize will be announced 30th of January. Jari Paasikivi award is based on his actions in Uponor Corporation's Board of Directors. market value has evolved over the last two years, significantly better than the industry average. Presently, the yearly remuneration received by the Chairman of the Board equals €71,000, €49,000 by the Deputy Chairman of the Board, and €44,000 by other members of the Board. Approximately 40% of the remuneration is to be paid by acquiring Uponor Corporation’s shares in public trading and the rest in cash. The travel expenses related to Board meetings are paid according to the company’s travel policy. onwards, the segment is called Uponor Infra. Heidrick & Struggles and Merilampi.